I am imagine that Beatles fanatics are more discerning than Elvis fanatics are when it comes to imitators. I’ve been following Beatle tribute bands since 1989 and have yet to see a bad one. Some concentrate just on the music, while others take painstaking steps towards total accuracy. Sure, they all vary on certain degrees of excellence, but the par is set very high for the Beatles. On the other hand, I’ve seen some AWFUL Elvis impersonators, who thought you could just squeeze into a jumpsuit, sideburns, sunglasses and PRESTO you are Elvis! You can’t just put on a satin Sgt. Pepper outfit, granny glasses and fake mustache and suddenly become a convincing John Lennon. So, when I talked to the Beatles tribute band, Day Tripper, I wanted to know what inspires one to start a Beatles tribute band? How do you set yourself apart from all the others? I was impressed when I saw Day Tripper live, and even more impressed when I found out that they had only been together as a functioning band for two months! Shaun Friedrichs (John) and Frank Mendonca III(Paul) had worked together in the “Rock ‘N Roll Legends” show, which explains their great interaction on stage as Lennon and McCartney. Adding Bobbee Potter (Ringo) on drums and newest member Ray Wood (George) on guitar and the lineup for Day Tripper was complete. But don’t expect them to tour anytime soon. Their mission is to have a standing residency in Las Vegas. That means you can get your Beatle “fix” anytime you visit the ‘city that never sleeps’. That is fine by me as I plan on making their show a regular part of my annual Vegas visits! E.C. : First, how long have you been together? Shaun: A couple of months as a group. E.C. 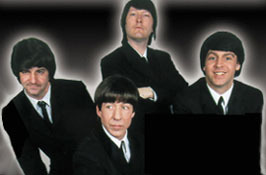 : Some of the other Beatle tribute bands tour around the country, play cruises, etc. Do you just play in Vegas? Frank: I think if it comes up, I don't see why not. Shaun: Frank and I have actually toured around a lot doing Beatles with other acts. But this show itself, this group got together specifically for the show here, so at the moment we're just planning on setting here. Frank: Its nice to have a sit-down gig at home. Bobbee: Some of the people that have come in that are locals say that its really nice to be able to come and see a Beatle band whenever we want to, without having to wait for them to come back to town. We're talking about the Beatle fanatics that come to see us for "their fix". "We can just go to the Frontier man, we're fixed!" E.C. : So it’s a pretty steady gig? Bobbee: Six days a week. E.C. : With all the competition of the various tribute bands, how did you decide to get a Beatles band together? Frank: Shaun and I worked in “Backbeat” for a couple of years together, toured the country - fairs and corporate stuff. Most of the Hard Rock's around the country, whenever they held a corporate function for a company, we'd be the house band. Shaun started working as "Lennon" at a show at the MGM. He needed a bass player that could do McCartney, so he called me up and I said, "yeah". Shaun: I was working down at the MGM and we got Frank into that show, as part of that show...it was kind of a "Legends" type show, it had all these different entertainers. So I got Frank in and we were doing strictly Lennon and McCartney, kind of like you saw [“Rock ‘N Roll Legends” type of show], it was that kind of idea. That was going over really good and we got the call from our producer Chris Davidson [who does the "Rock 'N Roll Legends" and “Day Tripper” shows in Vegas]. He was putting together the "Rock 'N Roll Legends" show basically and asked Frank and I if we'd be interested in joining. So we moved over here about 6 or 7 months ago [New Frontier], and was doing "Rock 'N Roll Legends" show. At that time we had a Sinatra show, a tribute to Sinatra, in the 5:30 slot in between the two "Rock 'N Roll Legends". When that show closed, Chris was looking for some ideas to try and bring a younger crowd in that 5:30 spot. One thing led to another and we talked him into letting us do the Beatles show. He said OK and we got these guys in and that’s kind of how this show was formed for this place. E.C. : Frank, are you naturally left-handed? Frank: Yes, I can play both ways. E.C. : The bass player for 1964 started playing right handed, learned the songs left-handed song by song until you got them all left handed. Frank: Same kind of thing for me, as a kid I started playing right handed because my brother and my dad played guitar right handed. So I had to do it right handed, or play it upside down. It’s hard enough to figure out chords strung correctly rather than upside down. When I started Beatles stuff, I decided since I am left handed "lets try it" and it came like that. E.C. : What kind of music did you play before? What kind of musical backgrounds do you have? Frank: I've pretty much done Beatles professionally for about 10 years. It’s only been Beatles, a couple of punk rock projects in LA just for kicks. Shaun: I've been playing in town, I was originally a drummer, When I got out of school I started working the lounges here in town just as a drummer, so I've played just about everything. Same with these guys. Bobbee: I was on the road for 16 years with a lounge group called "Shake, Rattle & Roll", I played oldies for 16 years. We basically did what they call the "silver circuit", which is basically touring all the towns and the cities here in Nevada. We formed in Orange county California. We started playing more in Nevada than California, so I moved to Las Vegas. Ray: I actually started out doing Elvis when I was 11 years old, until I was about 15. And then I got into regular music. I ended up doing Bobby Darin in the “Legends” show when I was 16. In between that I was learned how to play guitar and I was playing guitar in different bands. E.C. : How did you pitch Ray with the idea of being George Harrison? Shaun: I'd known Ray for years, we used to play together. Bobbee: That's basically how I wound up in the group, too. I'd known Shaun for about 12 years. We'd never played together but he'd come and sit in on my group. I started working with Frank and Sean at the MGM last year. Shaun: When we started to put this Day Tripper thing together it was only obvious, "OK well, Bobbee's our guy". And then we went looking for a guitar player I wanted not necessarily somebody that was like A George Harrison, cause we had to get a local guy. But, I wanted somebody that was just a good guy to work with. You know, if we have to, we can train him up, and then I thought of Raymond. Called him up and he said, "Yeah, I'd be willing to give it a shot." We sat down and ran through a couple of things and he picked the stuff up very quickly! That's how Raymond got in and now we're one big happy family. E.C. : I wanted to ask about your set list, because I've never seen a tribute band do "When I'm 64" or "The Ballad of John and Yoko". Frank: That's all my doing, a set list of basically what we had, what we could work with. We do most of the hits, but there are a few that aren't. Since Ray is new at it, were hoping to throw him a few new songs a week and maybe we'll change some things around. Keep it fresh so we won't get too bored. Shaun: In the beginning, with this set, we basically really wanted to do most of the hits because that's what people want to see, but we did want to throw a couple out that are out of the norm, so they can go "Wow, they did that?". E.C. : Are there any songs you would like to add to the set? Frank: Plenty! I'd like to change it all around and make it different each time. E.C. : You are called “Day Tripper”, so why don't you play the song, "Day Tripper"? Shaun: Well, the reason why is because since Raymond is new to the show, he actually hasn't learned it yet, that's all. E.C. : What is your rehearsal schedule like? Shaun: We try to rehearse a couple times a week, usually on our day off we go into the studio and rehearse some new things. E.C. : I imagine that you study allot of the old Beatle videos? Shaun: Oh, all the time, still doing it. Bobbee: You can never stop learning. E.C. : Who came up with the videos that you use on stage? E.C. : That must have been fun...did you sync the Anthology version of Eleanor Rigby to the Yellow Submarine footage? Frank: Yeah, that was one take! and its almost on, its about a fiftieth of a second off. The idea of course comes from "Beatlemania", cause they ran all that footage and it was a little political. But I wanted more of the crowd. We got the footage of Elvis doing "Something" from the Elvis A Rama museum. We also have footage, Elvis does "Get Back" in the studio, but all Elvis does is sing "get back, get back", like 6 minutes of him singing "get back". E.C. : Have you done any video or movie appearances? Frank: I did “Vegas Vacation”- a Beatle in the back. And in the old band just before Shaun joined in, we did a Mexican TV show, the "Lunatic Hour", however that translates from Spanish. We did a couple of songs live on that show. E.C. : What sets you apart from all the other tribute bands? Is it a different attitude? Shaun: One of the main things that we really try to do that allot of the other bands are doing...we try to copy the music pretty close as possible. But we don't wanna overboard on that. We want to make it sound as much like it as possible, but every once in a while throw like something you're not gonna hear like an outtake or something. Frank has a tendency to do that every once in a while, he'll throw an outtake...not songs but lyrics. E.C. : Like the "shoo be do wops" in the live "Revolution"? Shaun: I think one of the MAIN things that we really have that other bands don’t have is, we try to make, especially the early set, and we try to really just make it energetic. "Now you're seeing the Beatles LIVE" - they're gonna have that energy you know. Allot of bands sound musically great, but they're just kind of laying there. Another thing we try to do for our show for the different eras we really try not just to come out and look different, but also the attitude too. Each individual era is a totally different ballpark. The happy joking around stuff and then in 'Pepper' everything’s a little more laid back, but still happy. And then for like the later stuff its more attitude...we try and do that too. Bobbee: I've seen allot of other tribute bands and ours seems to be a little more personable, we involve the crowd a little bit more. The other groups are like, [plainly] "so how are you doing out there?" Shaun: It’s still a fairly new show, so were still trying to iron out a few bugs. Ending the interview on a Beatles pun? Now THAT was a typical Lennon remark!